Here you can see the effect of GEOCOIR®/DeKoWe® 900 erosion control blanket being used to construct vegetated geogrids to reclaim lost property due to embankment erosion. 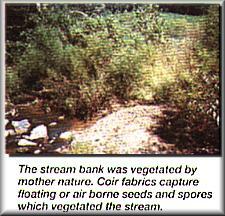 Once the vegetation is established it acts as an erosion inhibitor. Without GEOCOIR®/DeKoWe® this would be a difficult accomplishment. 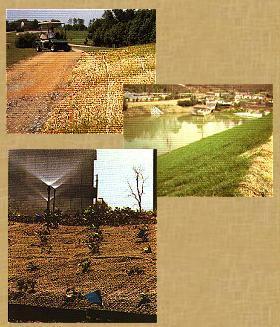 An erosion control blanket can be a very effective way of stabilizing the landscape, preventing erosion, and enabling the growth of vegetation on the land. Further, an erosion control blanket made with coir fibers, fibers derived from the husks of coconuts, has many advantages to synthetic materials including better water absorption, high tensile strength, and eventual decomposition of the fibers. GEOCOIR/DeKoWe geo-textiles are made of pure coir drawn from the husk of the coconut without adding any synthetic material - a 100 natural product. 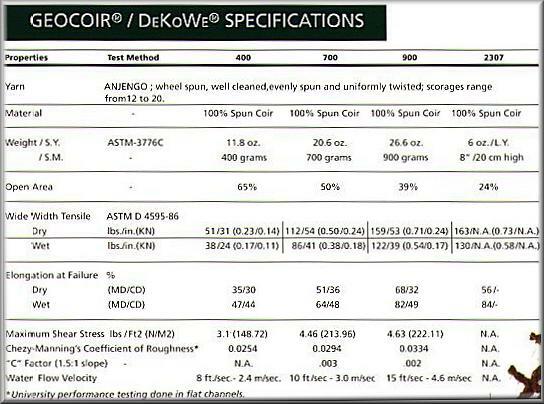 This is GEOCOIR /DeKoWe's most essential, distinctive feature compared to conventional geotextiles used for soil stabilization, reinforcement. 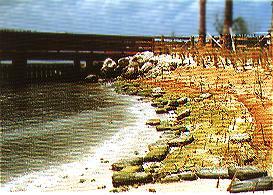 landscaping and erosion control. As soon as they have accomplished their function as slope protection/erosion control (10 years depending upon application), GEOCOIR / DeKoWe geotextiles decompose and fit into the natural ecological cycle, thus fulfilling the claim for indulgent, near-natural landscaping. Apart from decomposing after doing their job, coir fibers have other enormous advantages compared with synthetic fibers. They are highly water absorbent, while retaining their physical properties. They store up water and build an ideal microclimate for the seeds underneath. 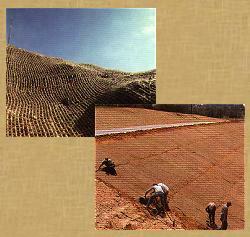 Of all natural fibers, coir has the greatest tensile strength. Coir fibers are derived from the husk of coconuts, the versatile fruit known as the gift of the tree of life. The coir fiber is a renewable vegetative resource. GEOCOIR/DeKoWe fabrics are available in several weights and configurations The woven coir blanket is available in three weights 400, 700 and 900 grams/sq. meter (12, 20. 26 oz/yd). Each fabric has a unique engineering and erosion protection function to perform. 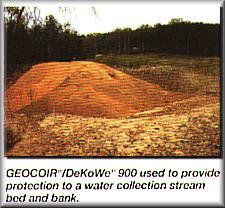 GECOIR/DeKoWe 2307 is a flexible stabilization fencing system designed to act as geocell to support earth embankments until vegetation is established. It is a very flexible and cost effective system. Stake length: minimum of 18"
NET OPENING SIZE Apx. 3/8" Apx. 3/8" Apx. 3/8" Apx. 3/8" Apx. 3/8"
STITCH WIDTH 1.5" 1.5" 1.5" 1.5" 1.5"
* 3/8" - 3/4" 1/16 - Net Size based on State D.O.T. Requirements - Rapid Degradable available upon request.